And i'm going to be totally honest, I quickly jumped on the Insta-story highlight train...without really giving their appearance a second thought. But then I realized that these cute little circles in our Instagram profile actually matter WAY more than we probably think - because they are one of the very first things that a new potential client/customer/follower will see when they click over to our profile. Luckily, i've created a quick and easy (and free!) 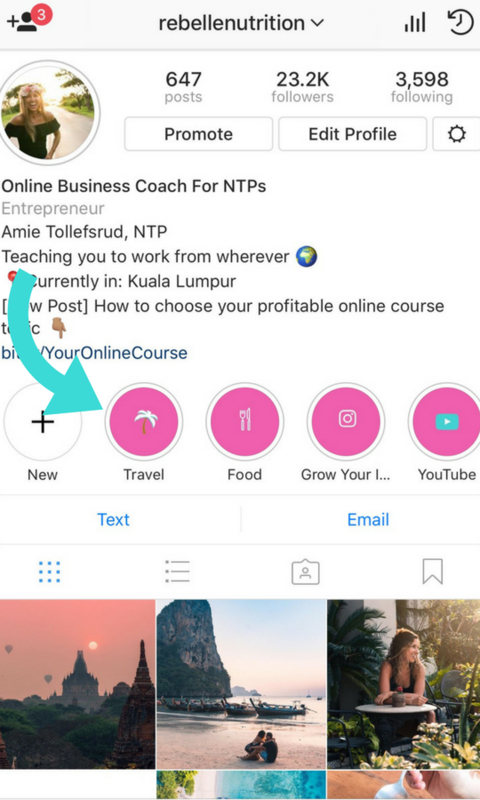 tutorial on exactly how to create Instagram story highlights that are not only branded to fit the colors, fonts, and icons you use in your marketing - but to create an awesome first impression so that that turns those Instagram viewers into followers, clients and customers. Get my free tutorial on how to create branded Instagram story highlights! Was this tutorial helpful to you? Be sure to share it a friend! And make sure to check out my other Instagram freebies here! In case you couldn't make it to the free training I held on this topic a few weeks ago, here's what you missed! I hear you, and I was right there with you at the beginning of 2018. If you’ve suspected that the Instagram algorithm has changed again, you’re totally right. And the thing about the algorithm is that it WILL continue to change…so things that may have worked to grow your account only 6 months ago may no longer be working for you. Even some of my past recommendations are now outdated. So today i’m going to be covering all of the new algorithm changes and hashtag rules for 2018 - yay! Want to know how I built a six figure business using Instagram? Join my free Instagram training! But first, why are we even talking about hashtags in the first place? And why do they matter so much in the growth of your Instagram account? Your hashtag strategy is ESSENTIAL to the growth of your Instagram account (and thus, your business). So not only does this mean we need to be strategic in our use of hashtags, we also need to stay up to date with the algorithm to know which hashtag actions are actually frowned upon by Instagram and will prevent your content from being seen altogether. Speculation has been all over the place lately. Should you use 5? 30? or 60? hashtags? Well, based of the most recent algorthim changes, my recommendation is to limit your hashtag use to 25-28 hashtags. This is for a few reasons: number one, if you use the maximum amount of hashtags either in the caption or first comment, when someone in your audience tries to comment on your post WITH a hashtag, their comment will fail to post because you’ve already reached the limit. Above is a photo of what will happen. And this matters because the amount of engagement you get within the first hour of posting is VITAL to moving your content higher up into the feeds of your audience to be seen by more people. This concept is basically "the algorithm 101": The more comments and likes you get on your photo within an hour of posting, the more people within your audience will actually see your new post. So we definitely don’t want to be preventing anyones comments from getting through. The second reason you want to use only 25-28 hashtags instead of the previous recommendation of 60 is that it keeps you in the safe zone, away from being ‘shadowbanned’. A shadowban is basically Instagram’s way of cracking down on potentially spammy or “bot”-like behavior, which is great - because it means hopefully we’ll be seeing less fake and automated comments like “nice pic” on our photos. But it also means that we have to be super careful to make sure that none of our actions (as legitimate accounts) APPEAR to be spammy or "bot"-like, otherwise Instagram will temporarily suspend our accounts from being seen by new traffic. Now obviously there are a ton of different ways that your account can potentially be flagged as spam on Instagram, but since the topic of todays training is hashtags, i’m going to be focusing less on avoiding the shadowban and more on how to create a hashtag strategy that is in alignment with Instagram's new algorithm. Where should you put your hashtags? Now that we know how many hashtags to use, you’re probably wondering WHERE to put them. In the first comment or in the caption? And the answer is, according to help.Instagram.com, that either one actually still works. However, I am part of the camp that believes that Instagram *may* not always be telling us as the public the complete truth - because if they were to tell everyone exactly how the algorithm works, there would be no need to pay for Instagram ads (<<< smart business people!) So just because both the caption and first comment will still work, doesn’t mean that both are optimal. According to my experimentation and testing, i’ve found that photos posted with the hashtags in the caption get higher reach and better engagement - due to the fact that hashtags posted in the first comment don’t always show up in the hashtag search. This means that if you aren’t showing up in the hashtag search, that means less new eyes on your photos and part of the reason why your engagement could be down. This does come with a caveat though: if you’re posting your hashtags in your CAPTION: you’re going to want to make sure and proof read your caption and MAKE sure the hashtags you use are correct BEFORE posting - because the more times you go in and edit your caption or photo after it has been posted, the less people you’ll reach. I have no idea why this is, but Instagram seems to penalize you if you do things like edit your caption, or even delete your post and repost it. Which hashtags should you avoid? Copy and paste my hashtags! 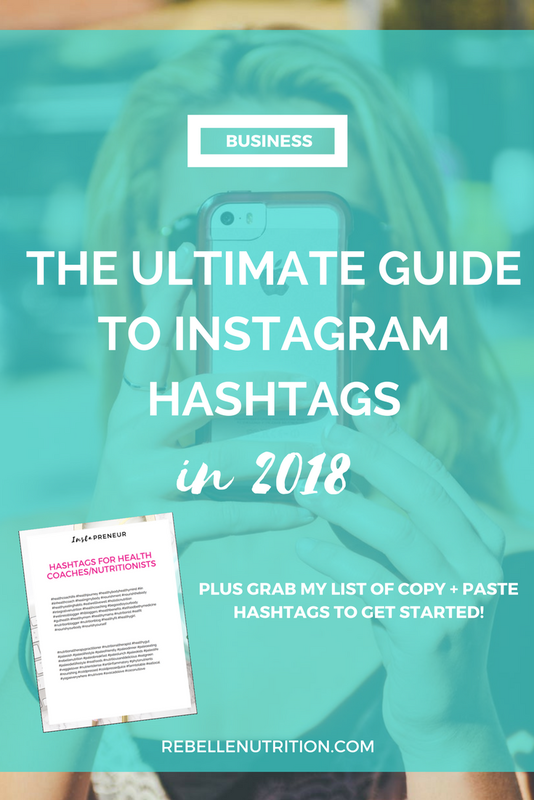 For the most part, you’re going to want to avoid hashtags that look spammy (for example #likeforlike) or have been used more than 1 million times, because unless you already have a massive account, your posts are going to get lost quickly among the hundreds of thousands of other posts using that same hashtag and you are very unlikely to ever show up in the top posts for that hashtag. To check if a hashtag is spammy, simply just do a quick search and make sure that the posts that come up are actually descriptive of whatever that hashtag is. Above is the #likeforlike hashtag, and it doesn’t explain whatsoever what that hashtag is its just a bunch of random photos. Not ideal. Also be sure not to use broken or banned hashtags, because thats another thing that Instagram can "shadowban" you or even disable your account because of. For example: #kansas was banned last year because too many people were using it on posts that violated Instagram guidelines. Definitely double check your hashtags to make sure they aren’t banned. To do this, simply search for the hashtag on Instagram. If the top posts section appears but nothing else, it’s likely that the hashtag was banned by Instagram. Sometimes Instagram will even leave a short message on a hashtag page explaining that posts have been hidden for not meeting the community guidelines, like you can see in the photo above. Now although this seems like a long and tedious process, just be sure to quickly check all of the hashtags you plan to use before using them because you definitely don’t want to be unknowingly using a banned or broken hashtag. Now that you know which hashtags to avoid, how many to use in 2018, and where to put your hashtags: a cool new feature that Instagram has rolled out is the ability to “follow” hashtags. This is an incredible feature that is similar to following another account. To follow a specific hashtag, just search for it by clicking on the microscope icon, then clicking "tags". That will pull up the top posts for that hashtag and the recent posts, and by hitting the blue "follow" button, your feed will then start showing you select posts using that hashtag within your feed (just like if you followed an account). rom here Instagram will also show you a list of suggested tags to follow based on your interests. So why is it a good idea to start following hashtags? By following hashtags related to your industry, you’ll be able to gather new hashtag suggestions (deemed by Instagram as highly relevant) and add them to your arsenal of hashtags that you switch between (I like to save mine in the notes app on my iphone) and then just copy and paste them into your posts! PLUS by taking advantage of this new feature, your profile is *rumored* to be favored by Instagram's new algorithm, which I totally believe - Instagram totally favors those who are early adopters. Lastly, encouraging your audience to follow your branded hashtag (so for example, #rebellenutrition) is a great way to build brand awareness among those who already follow you, and hopefully become a suggested hashtag to new audiences as well. Are we friends on Instagram yet?! Follow me here! How often should you be switching up your hashtags? Now, since I know this is a question that will come up, how often should you switch up your hashtags in 2018? The answer is you should be switching up your hashtags VERY frequently. All the freaking time, in fact. The reason for this is that if you continue to use the same set of hashtags all the time, this, again, could set off Instagram's “spam” filters. Repeating the same hashtags over and over again is something that a fake account would likely do, and like I mentioned earlier, Instagram is trying to crack down on this. But don’t worry, if you’re switching up your hashtags frequently and making sure all of your hashtags are relevant to the photo that you’re posting, you wont have an issue. Want to know how I built a six-figure business in 9 months with the help of Instagram? Join my free instagram training! "Aren't e-mail lists kind of...old school?" Simply...yes. However, e-mail lists are still the MOST powerful component of growing/monetizing your business in my opinion, whether your business is completely online (like mine), you see in-person clients, you're a Beautycounter consultant, OR you don't even have a business yet, but you plan to in the future. Your e-mail list is the backbone of your business - no matter how huge your social media following or how much you love Instagram (and trust me, I loooove me some Instagram). The algorithm can never hide your e-mails from your list/ restrict who sees your e-mails. Your e-mail list is the most direct line of communication you have with your audience. 1. Create an irresistible lead magnet: A lead magnet (also called a freebie or opt-in) that your ideal client/customer cannot resist is the #1 key to growing your e-mail list. Lead magnet examples include PDF downloads, video trainings, cheat sheets, worksheets, etc. (Check out my list of freebies here). Now, the key to getting your lead-magnet to actually grow your list is to require that your audience provide you with their name + email address before receiving the freebie. Once they enter in their name + e-mail address, they should automatically receive their free download and then boom! You've provided your ideal audience with something super valuable for FREE, and you are on your way to turning them into a lifelong fan/customer/client. *Pro tip: to encourage people to download your freebie, say something more enticing than just "download X to get on my email list!". Instead, try something like, "ready to reduce painful bloating in 7 days? Download my free meal plan!" 2. Leverage social media: Now, what is an amazing lead-magnet going to do if no one can find it? This is where social media plays a HUGE role in helping to grow your e-mail list. 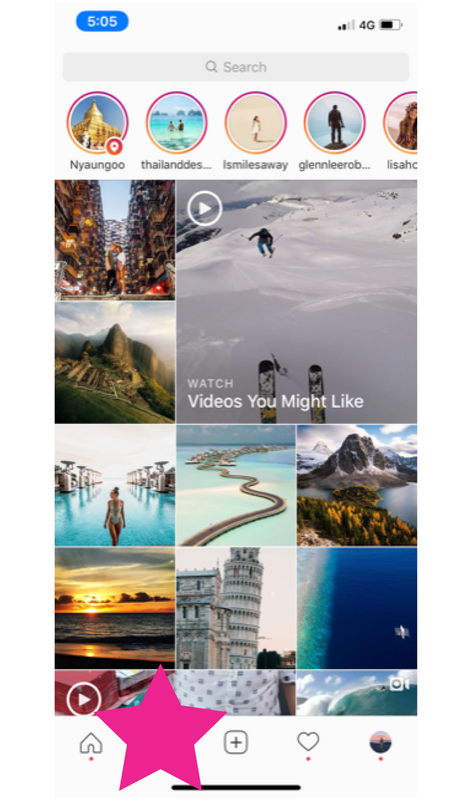 Personally, I love Instagram because it is so visual, more people are using the platform than ever, and there is a video component (having your audience see you on video makes them much more likely to know, like, trust-and eventually buy from you). So, using Instagram as my example, I recommend CONSISTENTLY sending your audience to your amazing lead-magnet, either via the clickable link in your bio OR the swipe up feature on Instagram stories. No swipe up feature yet? One way to make it SUPER easy for your audience to get your free download is to do an IG story related to the freebie, and simply tell them to DM you if they want it! This obviously take a little more time on your end to manually add them to your email list, but the return is amazing. 3. Repurpose: How often should you be sending people to your amazing lead-magnet from social media? At LEAST 1x a week. But don't worry, this doesn't mean you need to be creating a new lead magnet every single week. Even if you only have one PDF, video training, cheatsheet etc. on your website right now, you can continue to drive traffic to it by simply switching up the ways in which you talk about it. For example, let's say I have a free video training on my website about how to optimize your Instagram bio (I do 😉). One week, I might mention how I had 3 new clients book to work with me after making a few key changes to my Instagram bio, and then send viewers to the link in my profile to learn what they were. The next, I might talk about how your Instagram bio has the ability to attract or repel your clients within a number of seconds, and how to make sure you are conveying the right message. *Pro tip: Just because you are promoting the same lead magnet (or rotating a few different ones) doesn't mean your "pitch" has to be boring and sales-y. Get creative, think of stories related to your freebie, and as always, pitch your lead magnet as providing value to your audience (because it is!) not just a way to get on yet another email list. Want to learn how to bring more (targeted!) traffic to your website for free? Grab my free guide here! Tell me: do you have an email list? What is your biggest struggle getting people to join? I'm obsessed with online courses. First I was obsessed with taking them, now i'm obsessed with creating them. Why? They are most flexible, fun, and profitable business model with the least amount of overhead. This blog post is going to explain the 10 reasons why I think online courses are the best business model, why you need to create one in your business, and how to choose your profitable online course idea. 1. You don’t necessarily need any sort of credentials or certifications to create an online course - just experience, passion, and knowledge. This means no more feeling like you don't know enough yet, or that you have to go back to school first before you get started. Your current experiences, knowledge and passions are enough! 2. Low overhead: you can start creating an online course for FREE using teachable. What I do is start with the free Teachable plan, start building out my course, and switch to the pro version once i’m ready to start selling (to save money on transaction fees). You’ll also need an email service provider and a website for the most success, (I recommend Convertkit, get a free month trial here) but Mailchimp also has free options. A website is also essential, but again, using Squarespace, this is $12-$18 a month tops. I currently spend about $199 a month to keep my online course business afloat (which still is almost nothing compared to most start ups) but you could easily get started for anywhere from 12$ a month (not bad considering the income potential of online courses). 3. Time freedom! You can work on building out and selling your course whenever you want. You can work on weekends only, a few hours a day, or an hour a week for a year, its totally up to you. When I was still working another job and building my business at the same time, I would spend 4-5 hours every morning working on creating my courses, and then go to my restaurant job at night (because I needed to be bringing in money until I launched it). 4. You're not trading time for dollars! This means, once your course is launched and you have an evergreen funnel in place, you can potentially start making money while you sleep, travel, or take a day off. You're not chained to a certain $/hr salary like you would be if you only saw 1:1 clients or were still chained to your 9-5. 6. Share your message/ teachings with the masses! There is no way you can reach thousands of people if you’re still relying on 1:1 consultations. There just isn't enough time, energy, or enough of you to go around. Online courses allow you to reach a large number of people at once, with the same amount of effort it would take to teach 1 person. 7. An introvert's dream. Who else gets emotionally exhausted from seeing 1:1 clients all day? Don't get me wrong, I still lOVE seeing 1:1 clients because I love digging in deep with people and getting into the trenches with them on their business. This is important work. But if you are an introvert, there’s no way that you’ll be able to do this 8 hours a day, 5 days a week, for the next 10, 20, 30 years. Side note: I also think it is VITAL to have seen at least 15-20 1:1 clients before putting in the effort to make a full online course, just to make sure there is a market for it before you spend months or years creating it (but thats a topic for another day). 8. No cap on the amount of money you can make. Let that sink in for a second. NO CAP. Want to make $10,000 next year? Totally doable. $100,000? Cool. Multiple six figures? Me too! Obviously, the size of your audience and profitability of your course topic will play a huge part in this, but nonetheless, these numbers are totally achievable when you're not trading time for dollars. Need help choosing your profitable online course topic? Download my free guide below! 9. You never have to rely on someone else: the ultimate job security! This is why I always encourage people to create their own product or service rather than rely on things like affiliate income, freelance work, ads, etc. because although those can be great supplementally, you’re still relying on someone else for your income. You have to abide by the company rules, post when they want you to post, etc. OR you need a massive audience to make any amount of livable income (as in with ads). With online courses, you really don't need to have a massive audience -you just need to have an engaged audience full of the right people. 10. Online courses are the ultimate answer to working smarter not harder, creating flexibility in your schedule, and making the amount of money that you want to be making. Sounds simple enough right? And it is, with the right guidance :) As you might have guessed, i'm in the process of creating my next online course, all about exactly how to create and launch your first online course. Want to be the first to know when my course about courses is available for pre-sale? Join my VIP list! Have you considered creating your own online course? What topic would you choose?